This year we are exploring and pursuing our dreams here at Better Endings. Each month I invite you to put forth a deep personal question that relates to your high spiritual quest, let’s say, for it pertains to your greatest sense of mission or life purpose, in this life or beyond. After posing your question (week 1) I encourage you to pay attention to and record your nightly dreams (week 2), then to contemplate your waking dreams and emerging insights about your question (week 3), so by the end of the month (week 4) you can compose/ write a Better Endings story or scenario about how best to incorporate what you have learned into your future Life Path. In my dream I am at a campus of—truly—Higher Learning (n.b., always use present tense in recalling your dream). First I am visiting a sports field where teams dressed in white and azure blue are playing a game akin to soccer except they use thought impulses to propel or to counter the ‘ball’ along the field a to goal area. A middle-aged appearing man approaches the field to observe the game with us from the right. I think to myself, ‘Is that Stephen Hawking?’—from his shock of hair though it is reddish here, and from his lithe step…until I realize this man is not in a wheelchair, which throws me at first. Then I wheel/ drive a wheeled chair vehicle to carry a friend (woman, semitic appearing) to a special meal event. (This part was so important in my dreaming that it had an instant replay so I would be sure to recall it on waking.) The guest of honor at this honorary meal was indeed Stephen Hawking! This time he appeared more like I would envision him though he was seated upright and without any wheelchair or speech problems. Hawking shares a new insight he has gained since translating his form into the higher planes with the death of his physical form. Luisa observes that the principle he is describing could help ‘the Poor’ (though she qualifies that she is not yet sure if she would support such use for the sake of wanting people to strengthen rather than being dependent on quick solutions). Hawking agrees. He says that ‘students’ can, ‘even now’ (i.e. in the Physical, I surmise) use this principle to create abundance to meet their immediate needs, by manifesting through some sort of feedback loop effect, “reflecting (thought? spirit?) back on itself.” This statement is so astounding and exciting to me in the ‘dream’ that I wake up immediately on hearing this (btw, a good way to remember an important lucid dream message is to train yourself to wake up right then). So, “What’s Love Got to Do With It?” Everything. My bigger question about Love this month is ‘(How) Can Love Matter?’ which itself more deeply asks: Is there (after all) a meaning and purpose or positive results from living this (i.e. a particular) lifetime? As Love Is All, the basic fabric of the Universe and all things and Spirit Itself that fills such universe (my view), What/How Can Love Matter (“in the End”)? In this dream of Stephen Hawking continuing to grow and share his uniquely gifted insight from Beyond in an after this lifetime context, well then, Wow! Love/ Life/ It CAN and often DOES Matter, Very Much! A lifetime of experience is not wasted and provides spacetime for developing or honing awareness and, hopefully, wisdom. We are unfolding this individualized awareness and character not just in a single lifetime (my belief includes the assumption of reincarnation to the point of eventually transcending even that); and not only in our current bodies that carry us along for a life cycle, but beyond that as well. It comes down to what we can do with the love we have expressed and the awareness gained in a lifetime of focused experience. The old adage, “you can’t take it with you” does not abide here. True enough, we do not take or physical body nor our material acquisitions with us as we translate from this lifetime into the next/ other dimensions. But we do retain our individualized consciousness as a facet of our higher Soul awareness, a spark of divine wisdom, a molecule in the creative fountainhead, from the Ocean of love/life force Itself (my limited view, of course). “Soul is a happy entity. I meant the first post for this month’s Topic of Life Lessons to be a general introduction to the topic, which I have already written. Instead, I have had a three-part dream this morning and realized while driving to work this morning how it conveys a major life lesson for me: Love Equals Love. Along with this, Acts of love are Heroic! In my dream I am visiting all day with a lifelong friend. Since my friend’s gender in the dream is ambiguous, I will call my friend here Dona (Donna/ Don). In Part I of this dream Dona is visiting me and we share some experience together like attending an event or a class, but I do not recall that segment. After that activity, Dona drives us back to her/his location and I ride in the car, talking familiarly with my friend and grateful to be in Dona’s presence. We arrive at Dona’s place and sit out on a portico (that is the word that comes as I write out the dream), suspended over a gorge with water below. After talking awhile I realize I have brought my orange tabby cat Emily with me on the visit but did not bring a litter box, so I say maybe we should be leaving. (This often happens in a lucid dream that some element of a physical-world concern can intervene and shorten the dream experience.) Dona says–I believe not wanting that I should leave so soon–that visiting animals often use a fenced area down in the gorge below for their needs. Sure enough when I look down to the gorge (where previous to this I had looked and saw a large dog in a region beyond a further fence), Emily is already down there and does relieve herself. One and then up to three or four other ‘local’ cats have gathered just outside the inner fenced area where Emily is. I mention this to Dona. All of a sudden Dona gets up and DIVES off from the portico over the cliff! S/he transforms into a cat on the way down so that s/he lands on her feet and then transforms into Dona again, to save Emily from the cats that might have attacked her. After realizing what has just occurred, I (with I think my sister Cheryl) go down a trail to the bottom to check on Dona and Emily. A younger woman with blue and pink hues, blonde, is coming up as we go down (angelic?). We get there and Dona is lying down, okay but needing to recuperate, enclosed in a blanket or even a protective tube to help him/her to regenerate from the hard landing. Emily is fine and I have her in my arms to carry her. We will bring Dona up in the tube, but meanwhile Dona is talking about how this will make for a great story to tell later. Quite a story, Indeed! Dona says this is about the need to take bold action on behalf of others; that this is a sort of action often not taken in today’s world! I had been thinking of a spiritual expression I like: Soul = Soul. But then came this slight emendation: LOVE EQUALS LOVE. I realized then how the dream itself was about the love that comes with lifelong friendship; and as well, Dona’s leap into the gorge off from the portico to protect my cat Emily (whom I also love) was an act of love as much as an heroic act of itself! Dream Reflection: Whatever form love takes, it IS Love. And love, to be love truly, is always reciprocal. Love engenders Heroic qualities on behalf of the Beloved. (for, Love = Life = Love). I welcome YOUR Story and Comments! It presents a web of potentiality framed around themes you are focused upon Now. It constructs a seemingly coherent life history with the illusion of a consistent identity, a life story that you develop from infancy until your departure. Yet you are by no means limited to this Reality. Daydreams, nightly dreams, and creative visualization provide many windows to open and avenues to explore that are not bound by your daily drama. Have you ever wondered about parallel realities and how this notion might pertain to dreaming? Have you had glimpses of what felt like parallel lives? I then shifted consciousness back to my body and life in Colorado and opened my eyes ‘here.’ I felt immediately that I had been experiencing a “dual conscious” state of awareness. I understood that this was what was causing the partial amnesia in my alter-Self awareness. Because of the dual-conscious moment, some sort of overlap had occurred between two parallel realities, two of my own parallel identities. This experience also reminds me of a Star Trek Next Generation episode where Captain Picard lives an entire alternate lifetime in 40 minutes. He has been affected by a probe from a planet that had been destroyed when its sun “went nova”; they had programmed the probe to reach one person who would learn this way about their lives and existence. What stands out to me about the parallel life awareness is that this was something other than a normal archetypal “personal unconscious” dream event. It did not feel symbolic at all, but very lucid (I was aware somewhat of the dual consciousness state while it was happening), and it was simply very real. What can we learn from this sort of glimpse into a parallel reality? Mainly, for me I suppose, that there is “so much more” to Life than what our limited minds can perceive. Also, it suggests to me that a true change in consciousness can allow us to alter anything about our current life dream “drama” that we deeply CHOOSE to change. This is by no means easy, because it requires a true change in our conscious construction of the life we are living. It is not simply a matter of having a strong intention so that a “law of attraction” can operate. It requires a fundamental shift in your awareness of what is possible, and then a conscious choice and decision to act on establishing appropriate changes in your life. In first person, present tense, simply establish an alternative identity. Maybe this identity would realize a wish you may have had about a life you might have lived if you were not ‘you’. Describe yourself in this alternative lifescape. Be as detailed and as descriptive as you can be. Write until you feel like you are really experiencing this other lifetime clearly in your imagination. When you finish this technique (which you can also do multiple times from several different alternative life perspectives), just take some time to reflect. At very least, this technique might help you to become aware of some unrealized but desired (or, not, depending on the alternate identity you have imagined!) potentials in this life. I would love to hear your insights or stories from exercising this Better Endings practice! It seems to me that thin boundaries relate to what we have been discussing this month in relation to the life metaphor “Life is but a Dream”. Let me start the final week of this month’s topic then by considering how enlisting your Teacher archetype to help you “mine” the positive metaphor Life is but a Dream can lead to your own Better Endings. Life as a Dream opens unlimited potentials because by their nature dreams allow creative flexibility. S: What CAN I do to move forward with my book project? Nothing is happening; it feels stuck without communication from others. T: Step back so you can look at the whole picture. Aim to gain a greater vision of what you are trying to express and share. S: Should I edit then? Revision the whole approach? T: One small step at a time, dear. Envision how you might reformat according to your highest Vision. Do you see how direct and easy Archetype Dialogue can be? It allows you to immediately tap into your own multiplicity, to query and then to listen to your own interior, alternate perspectives. This can help you to resolve inner conflicts and to move forward after “checking in”. The common notion of following your “inner counsel” is enhanced by envisioning your Inner Council of archetype Allies who are your intrinsic, ‘personal unconscious’ ensemble cast of mythic characters. Get to know your inner ALLIES, because that is what they aim to be, working together toward your own highest Good! I welcome YOUR comments and stories. Best of Better Endings: If you can finish a nightly/ lucid dream according to the way you would like it to end, you can apply that same principle to your “outer” life and reality. This dream showed me what it takes to re-envision my goals achieved! Some twenty years ago I dreamed I was hiking along a high mountain trail. Several others were also on a trek to reach the top of this peak. It was a hard trail with a steep, rocky incline in hot weather that seared the skin. Many turned back; only a handful reached the top, singly. I was among these, arriving at the apex after a long, winding ascent. Finally at the top, I see there is a canyon chasm between the edge of the mountainside I have scaled and what I know to be my true destination: an even higher peak separated from the one I am on by a huge divide. At first I believe I may be able to cross, for there are steps, suspended in space, hovering between the two peaks. One of the other climbers starts across these floating steps, but they become narrower and further apart as the aspirant attempts to bridge the gulf. He turns back, returns; the steps drop into the gorge as he steps back onto the ledge at the top of the canyon. The others leave, descending back down the mountain. I stay, alone, gazing across to the realm I desire to reach. I am passionately aware that I have worked so hard to reach this plateau, only to find my deepest goal seemingly impossible to attain. There is a picnic table at the canyon edge. I sit at the table, not wanting to give up, not knowing how I can go forward. A woman appears and comes over to stand next to me at the table. She seems an Ancient one, yet ageless. She has salt-and-pepper hair, dark eyes, light skin—she reminds me of a person I know to be highly enlightened in my outer life. “How can I ever get over there?” I implore of this woman whom I know to be a Guide. “How would you get to another planet?” she replies. Then, I am alone again; the Guide has disappeared. I awaken in bed, bemused by the dream, saddened to learn it “was only a dream”. It felt so real, like I was finally “almost There,” to the fulfillment of a spiritual Quest. Now, many years later, I recall this dream. The feelings are still potent, the desire as ardent as it was then. I sit for contemplation, return to the picnic table AS IF I have never left. “How would I travel to another planet?” I ask inwardly, suddenly aware of the obvious solution. “Direct projection,” I utter in silence. Assume the destination-state accomplished; be-here-Now. I walk to the edge of the cliff, sit tailor fashion; appreciate the rarified atma-sphere, quiet serenity. I close my eyes, open inwardly, sing a mantra syllable as pure as the air is high: Hu. I become this Sound, resonate with its pulse as a warm, glowing Light. I open my Heart to just BE. Feel… SHIFT. Open eyes: a Temple nestled in a misty enclave. Light forms come and go from round platforms surrounding a domed spire. Blues in magenta, iced in golds and white. Approach. Friendly beings exchange silent greetings as we pass. Enter temple—Door always open, an archway. Inside is still open space, nature, gardens, rooms that appear as I imagine a purpose: library, classroom, stables with horses. I explore, unlimited. See a fountain, sit at a gossamer bench around it, close eyes to listen to the Flow. Open eyes: sitting tailor fashion, looking across the Canyon. See? A picnic table, across the gulf, far from where I AM. 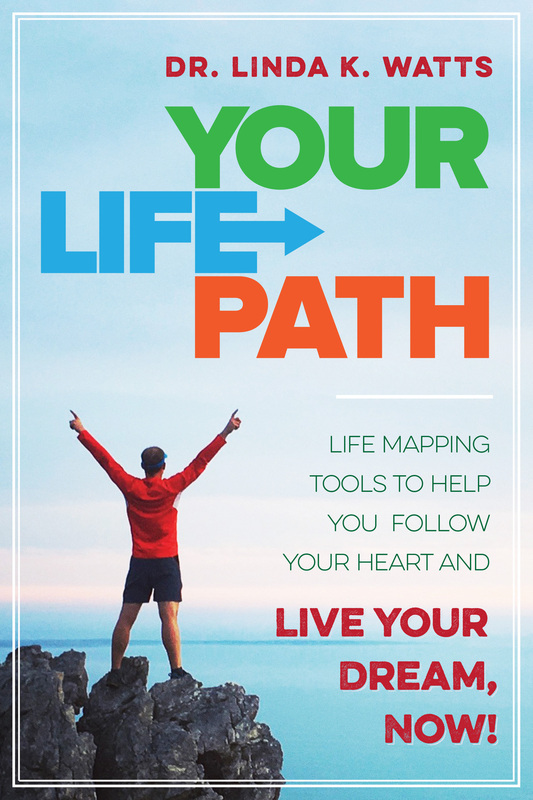 YOUR LIFE PATH is Available to Pre-order! This year at Better Endings for Your Life Path we are exploring Life Themes. Life Themes are those recurring types of situations in your life that together weave the primary narrative threads of your Life Story. Each month we will explore one of twelve Life Themes commonly discovered with Life Path Mapping. See the menu tab “Monthly Topics” for the month’s Theme. I also encourage you to list your own Life Themes and explore them as they seem relevant for you to the monthly Themes. Sign Me Up to FOLLOW Better Endings! FOLLOW: Send me daily Better Endings! What Difference Do You Want to Make? A New Year of Better Endings for YOUR LIFE PATH!